The Antennae Galaxies, also known as the Ringtail Galaxy or Arp 244, are a pair of colliding galaxies located in Corvus constellation. The interacting spiral galaxies have the designations NGC 4038 and NGC 4039 in the New General Catalogue. The galaxy collision resembles an insect’s antennae, which is how the pair got the name. The “antennae” are formed by two long tails of stars, dust and gas expelled from the galaxies as a result of their interaction. The colliding galaxies reveal a likely future of the Milky Way when it collides with the neighbouring Andromeda Galaxy (Messier 31) in several billion years. The NASA/ESA Hubble Space Telescope has snapped the best ever image of the Antennae Galaxies. Hubble has released images of these stunning galaxies twice before, once using observations from its Wide Field and Planetary Camera 2 (WFPC2) in 1997, and again in 2006 from the Advanced Camera for Surveys (ACS). Each of Hubble’s images of the Antennae Galaxies has been better than the last, due to upgrades made during the famous servicing missions, the last of which took place in 2009. 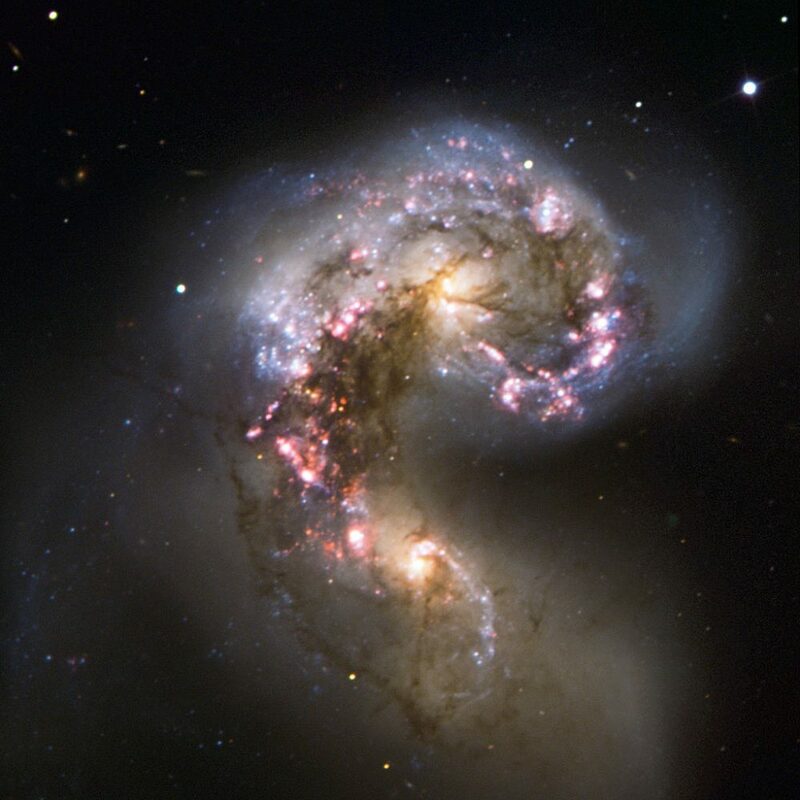 The Antennae Galaxies are one of the youngest examples of colliding galaxies, as well as one of the nearest pairs of interacting galaxies to Earth. The Antennae Galaxies are going through a phase of intense starburst activity as their colliding clouds of dust and gas compress massive molecular clouds and cause rapid formation of millions of new stars. Some of the newly formed stars are gravitationally bound and form massive clusters. More than a thousand bright clusters consisting of newly formed stars have recently been discovered in the Ringtail Galaxy by astronomers. 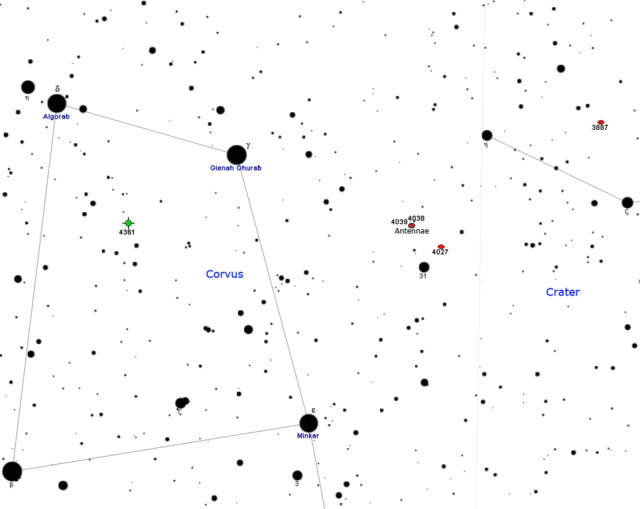 The brightest and most compact starburst regions contain super star clusters. Billions of stars will be formed before the galactic collision is over. 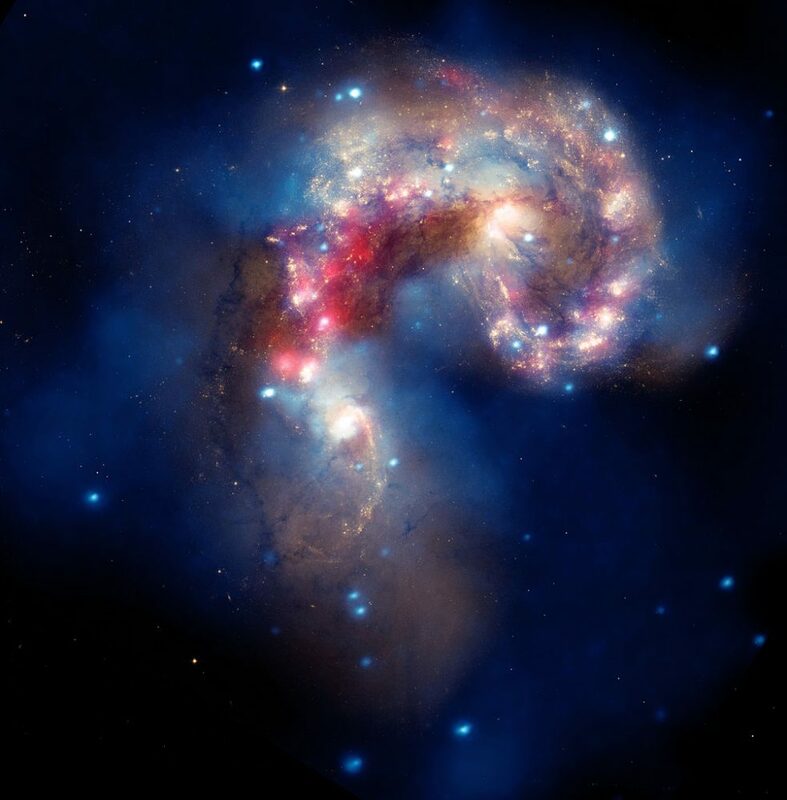 The Antennae Galaxies’ nuclei are in the process of joining to form a single giant galaxy. This will happen within the next 400 million years. Simulations of the galactic collision indicate that as the galaxies’ nuclei join to form a single core, the two galaxies will eventually form a single giant elliptical galaxy. The Antennae Galaxies lie at a distance of 45 million light years from Earth. NGC 4038 and NGC 4039 were two separate galaxies some 1.2 billion years ago. NGC 4039 was a spiral galaxy and the larger of the two, while NGC 4038 was a barred spiral galaxy. The two galaxies started approaching each other roughly 900 million years ago. At this point, the pair appeared similar to the colliding spiral galaxies NGC 2207 and IC 2163, located in Canis Major constellation. 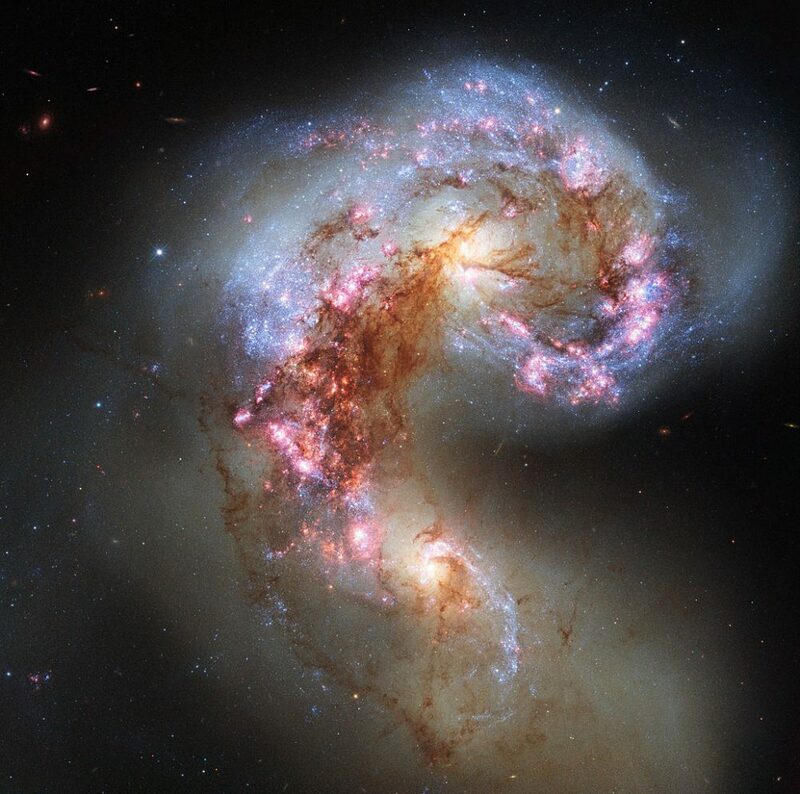 The Antennae Galaxies are believed to have passed through each other about 600 million years ago, when they may have appeared similar to the Mice Galaxies (NGC 4676), a pair of interacting spiral galaxies lying in the direction of the constellation Coma Berenices. 300 million years later, the stars in both galaxies started being released into intergalactic space. As a result, there are now two streamers of expelled stars extending far beyond NGC 4038 and NGC 4039, giving the pair the appearance of the antennae. The Antennae Galaxies were discovered by William Herschel in 1785. NGC 4038 and NGC 4039 are passing through each other at a very high speed, at hundreds of kilometres per second. The reason why the galactic merger is taking hundreds of millions of years to complete is the enormous size of the galaxies. The galaxies’ tidal tails that have earned them the name Antennae were formed 200 to 300 million years ago, during the galaxies’ first encounter. As the galaxies collided and passed through each other, some of their stars, dust and gas were drawn out into long tails of material. The two streamers will eventually either fall back into the newly formed elliptical galaxy or be lost to space. 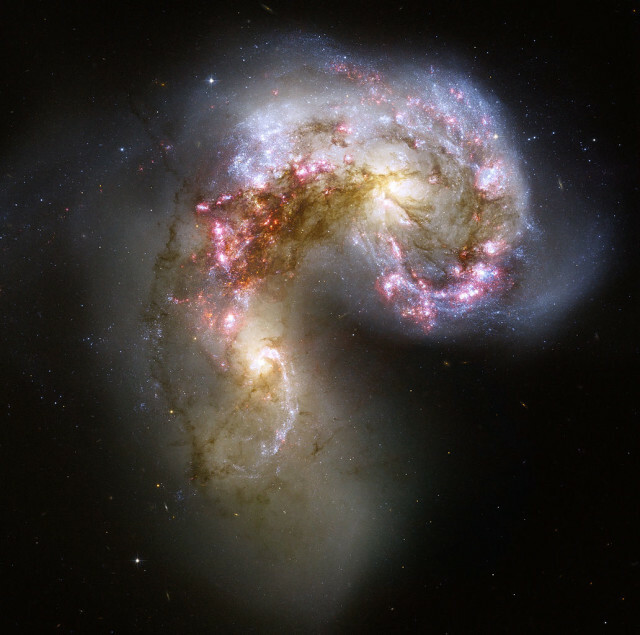 A beautiful new image of two colliding galaxies has been released by NASA’s Great Observatories. The Antennae galaxies, located about 62 million light-years from Earth, are shown in this composite image from the Chandra X-ray Observatory (blue), the Hubble Space Telescope (gold and brown), and the Spitzer Space Telescope (red). The Antennae galaxies take their name from the long antenna-like “arms,” seen in wide-angle views of the system. These features were produced by tidal forces generated in the collision. The collision, which began more than 100 million years ago and is still occurring, has triggered the formation of millions of stars in clouds of dust and gas in the galaxies. The most massive of these young stars have already sped through their evolution in a few million years and exploded as supernovas. The X-ray image from Chandra shows huge clouds of hot, interstellar gas that have been injected with rich deposits of elements from supernova explosions. This enriched gas, which includes elements such as oxygen, iron, magnesium, and silicon, will be incorporated into new generations of stars and planets. The bright, point-like sources in the image are produced by material falling onto black holes and neutron stars that are remnants of the massive stars. Some of these black holes may have masses that are almost one hundred times that of the Sun. 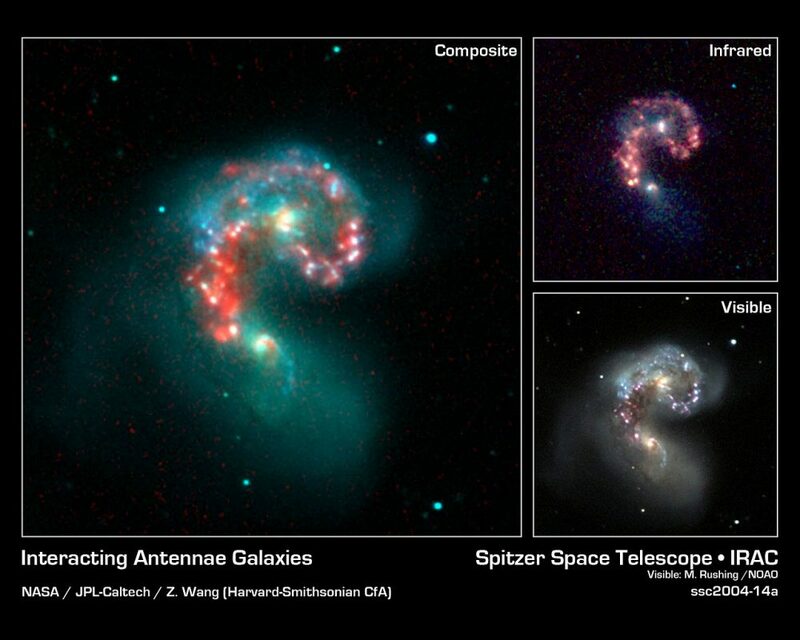 The Spitzer data show infrared light from warm dust clouds that have been heated by newborn stars, with the brightest clouds lying in the overlapping region between the two galaxies. The Hubble data reveal old stars and star-forming regions in gold and white, while filaments of dust appear in brown. Many of the fainter objects in the optical image are clusters containing thousands of stars. The Antennae Galaxies are members of the NGC 4038 Group along with five other galaxies. 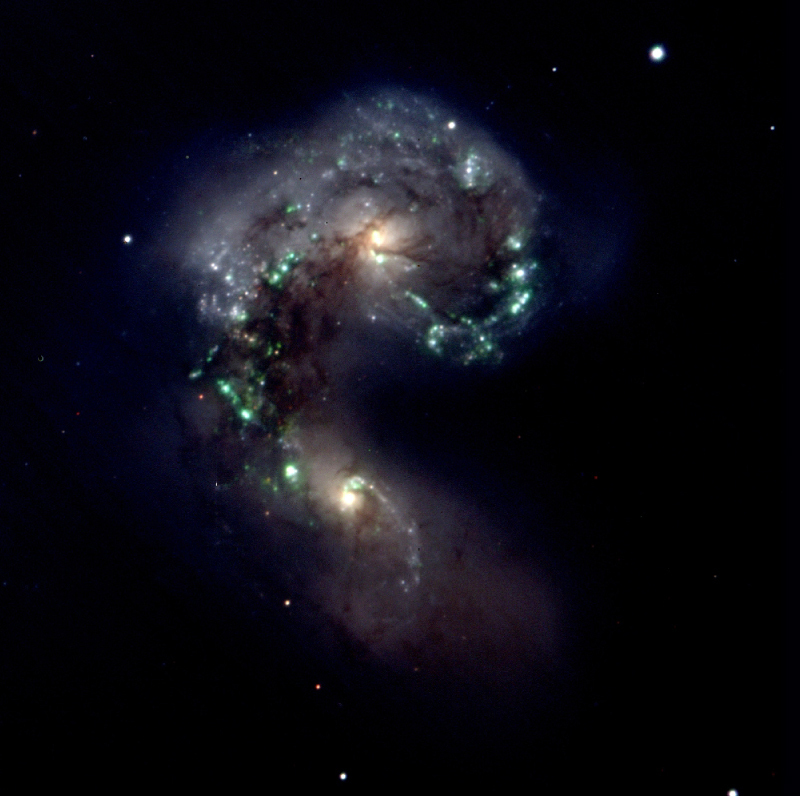 Two supernovae were discovered in the Antennae Galaxies in the last decade: SN 2004GT in 2004 and SN 2007sr in 2007. Most of the super star clusters formed in the Antennae will disperse within the first 10 million years. Astronomers have predicted that only 10 percent of these clusters will last longer. Roughly a hundred of the most massive ones will survive to eventually form regular globular clusters, similar to those found in our galaxy, the Milky Way. 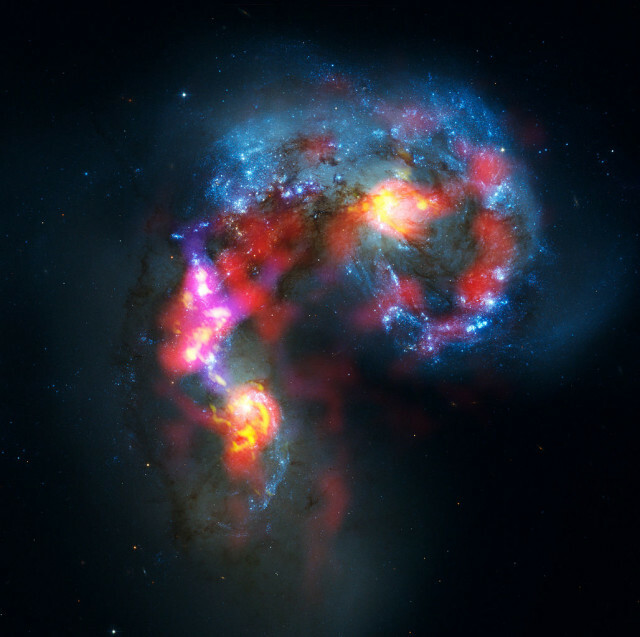 A Chandra X-ray Observatory study of the Antennae Galaxies revealed that they contain considerable amounts of elements necessary for the formation of habitable planets, including magnesium, neon, and silicon. The distance between the galaxies’ centres is estimated to be around 30,000 light years. The nuclei of NGC 4038 and NGC 4039 are believed to contain mostly old stars.